BLOVAC Air Pumps are used in industry to remove waste material from around working machinery by vacuum recovery or by high powered air blasting. 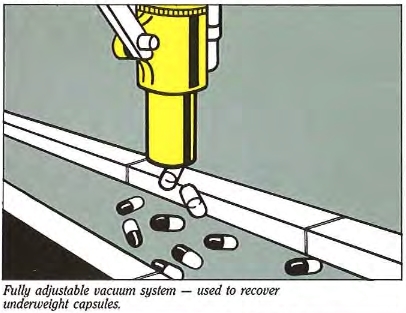 A22 – Heavy Duty Clean Up & Conveying – No Problem! BLOVAC Air Pumps are used in industry to remove waste material from around working machinery by vacuum recovery or by high powered air blasting. 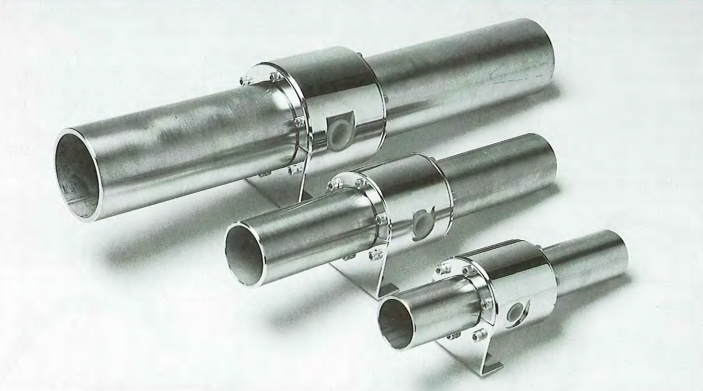 Using a unique spiral exhaust air flow principle, the BLOVAC AP22 gives greater vertical and horizontal conveying distances. Unlike conventional air movers, BLOVAC Air Pumps develop high air moving capabilities from a minimum air input.The smooth bore non-contaminate BLOVAC system ensures no residue contamination from previoulsy conveyed products and is ideal in the food and pharmaceutical industries. 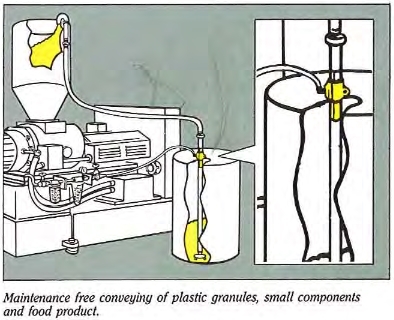 The BLOVAC AP22 is also resistant to most chemicals as it is made from Nylon 6. 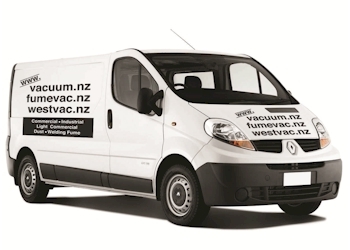 Being air-powered means no electrical breakdowns or maintenance costs and makes wet vacuuming completely safe. Blow clean machine tools such as lathes, drilling machines, milling machines, power saws etc. BLOVAC Air Pumps are designed to convey a vast range of products vertically or horizontally over extreme distances. 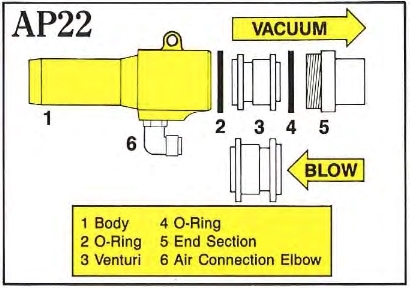 Due to their unique design, BLOVAC Air Pumps use two air flow principles, Venturi and Vortex. 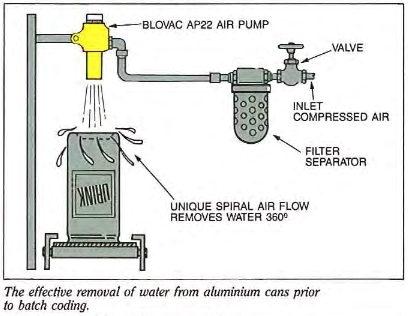 Compressed air entering an internal chamber is condensed and fired through several Venturi holes. These holes are angled in such a way as to create a Vortex principle, thus creating a vacuum. Due to the angle of the Venturi jets, air is exhausted in a spiral form enabling material to be conveyed via smooth bore house or pipe downstream. Cooling. In blow mode, Air Pumps can be used to provide cooling for a number of industrial and manufacturing processes. they can also be used to aid combustion. Quality Control. 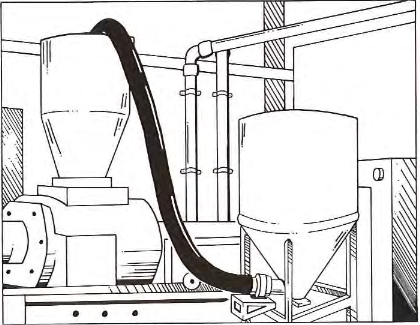 In the vacuum mode, Air Pumps can be used for vacuuming up underweight products and conveying them to a capture tank. Air Blasting. 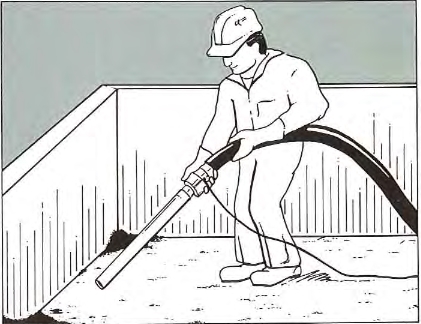 BLOVAC Air Pumps used in the blow mode can be used to quickly blow down machinery or structures to remove dust fall out. 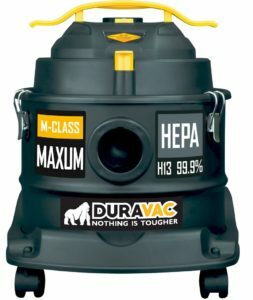 If you use compressed air, BLOVAC has the equipment that can cut costs by increasing your air efficiency. Cleaning, cooling, material handling, conveying, fume removal, combustion enhancement, weight sorting and poisonous residue removal are some of the many applications of compressed air which can be made more efficient by using BLOVAC products. If you have a manufacturing problem consult us. Our team may be able to suggest a simple air-powered solution. We understand that it sometimes takes a non-standard product to solve a special problem. If you need a product for a special application, just let us know. We frequently customise our equipment to meet special needs. 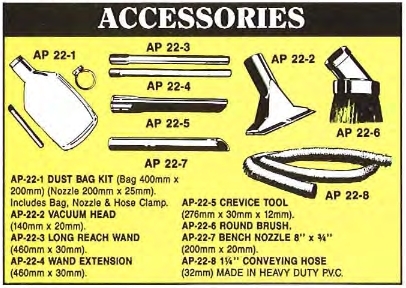 BLOVAC has a range of products beyond what is represented on this web page.